Twitch also known as Twitch TV is a live streaming video online website. The website makes a specialty of e-sports activities, Computer games, PlayStation, Nintendo, Gameboy, Sega and Xbox. When it comes to security, people are more secure with their accounts than life. To be secured, they might change password time to time. 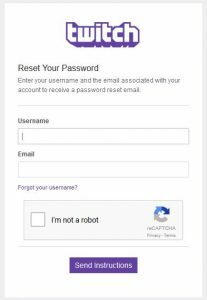 Because of that, they may forgot there password.To Reset Twitch password you can go through steps below. You need to open your browser on your PC and search for twitch on Google. There you will find various different result or you can click on this link https://www.twitch.tv/ for direct entry to the home page of twitch. There you can click on login button on top right corner or you can click on this https://passport.twitch.tv/authentications/new link to open your login page of twitch. There you will see “Trouble logging in?” text. You need to click on that in order to enter the reset page. Or you can click on this https://passport.twitch.tv/password_resets/new link to enter the reset password page. There you will see two blank space. One for username and another for email. You need to fill both spaces. After filling both spaces with respective data, you need to get ticked on “I’m not a robot” verify. Then after you tick, you need to click on “Send Instructions” button on bottom of the page. After clicking on that, you will see a link in your entered email address. You just need to check that link and click on that. Then after that you will proceed to enter a new password. The new password you choose should be strong enough and could be remember by you. You need to enter your password twice. Second time you enter will be for confirmation. It will check if you have entered the same password again or not. After that, you need to click on “Set Password” in order to save the changes. Than after that you will need to login. To login you need to enter your username in first space and your new password in the second space. After that you will logged in and you can always login with your new password. if you have used another device that you don’t use frequently than you should remember to sign out before leaving. This entry was posted in Account Reset Password and tagged Reset Twitch password, Reset Twitch TV password, Twitch, Twitch TV, Twitch TV reset password on February 23, 2018 by jcgbyHvNvn.